My core interests are in animal behaviour, evolution and conservation. 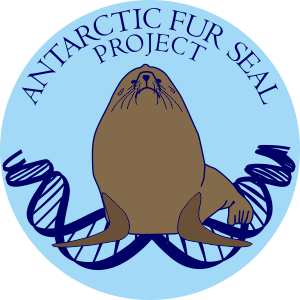 In my PhD thesis I plan to combine all three by using genetic and genomic techniques to gain a better understanding of the effects of climate change on Antarctic fur seals. These seals were hunted to near extinction in the 18th and 19th century, but managed to recover to a population size in the millions. However, due to climate change the species is on the decline again. I want to investigate how climate change affects this species on a genomic level. After working for several years in nature legislation and marine policy, I decided I wanted to pursue a career in academia. To gain a better understanding of animal behaviour and evolution, I chose to participate in the MSc program “Behaviour: From neural mechanisms to evolution”. As part of this course, I participated in research looking at the frequency of a mutation in the MC1R gene (responsible for blonde coat colourisation) in Antarctic fur seals from different breeding sites. The project aims to gain a better understanding of how the mutant allele spread in the population. This motivated me to learn more about the use of genetic tools in evolution and conservation biology. In my Master’s thesis I used microsatellite genotyping to gain a better understanding of the population structure and demography of Antarctic fur seals. Little is known about how recolonization of their former sites occurred after the period of intensive sealing. We used 39 loci to analyse population structure and genetic variation within this species. The results show strong population structure, suggesting that multiple populations have survived sealing. In my free time I love reading books, traveling, dancing and horseback riding. 2) Piet, Gerjan J., Ruud H. Jongbloed, Antony M. Knights, Jacqueline E. Tamis, Anneke J. Paijmans, Marieken T. van der Sluis, Pepijn de Vries, and Leonie A. Robinson (2015) Evaluation of Ecosystem-Based Marine Management Strategies Based on Risk Assessment. Biological Conservation 186: 158–66. doi:10.1016/j.biocon.2015.03.011. 1) Schutter, M., J. Crocker, A.J. Paijmans, M. Janse, R. Osinga, A. Verreth, and R. Wijffels (2010) The Effect of Different Flow Regimes on the Growth and Metabolic Rates of the Scleractinian Coral Galaxea Fascicularis. Coral Reefs 29, 3: 737–48. doi:10.1007/s00338-010-0617-2. For a full list of publications, including technical reports, see ResearchGate (link below).